This product has been discontinued, please see substitution products on FireSafeStore.com. Call us if you have questions. The 4B2100 is the new Sentry lighter weight, 21" deep, fire and water resistant vertical file cabinet. It has four drawers and is rated by ETL to protect digital media such as CDs. 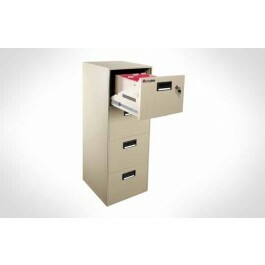 Each drawer can be set up to hold both legal and letter documents.